To have this large door cut into the long-empty, copper-shingled tower now containing his wife's library, architect Pomeroy had to obtain the permission of New York's Landmarks Commission. 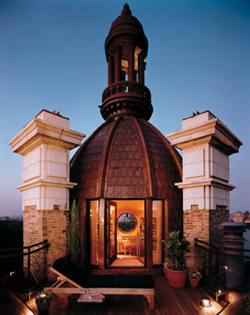 With liberal use of copper, his favorite metal, noted architect Lee Harris Pomeroy has transformed long-empty spaces into his award-winning penthouse apartment with spectacular views. For his extensive do-it-yourself project, he acquired the much-deteriorated servants' quarters and the empty tower of a grand, turn-of-the-century apartment house bordering on New York's Central Park. Most unusual among the many attractive features of the high-ceiling, nine-room apartment is the two-story library containing over 2,000 volumes inside the round tower. It is the workplace of his wife, Sarah, a professor of classical literature. Because the building is in a landmark district, Pomeroy had to obtain the permission of the city's Landmarks Commission to have a door cut into the copper-shingled tower (see photo) and to cut away part of the bronze dormers outside the large round windows he had opened in the east wall of the apartment. The door leads out onto a terrace, the inner wall of which Pomeroy had lined with copper sheeting to match the copper shingles on the tower and roof. A year before Pomeroy began his project, the copper shingles replaced asphalt shingles, which in turn had replaced the original slate shingles. The multi-panel copper screen beyond the dining table in the 30'x30' living room/dining area was created by artist Hatton Berry. Pomeroy commissioned two artists to enhance his home with copper. 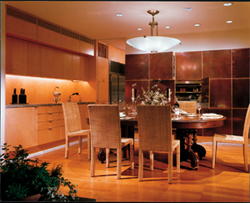 Hatton Berry created the treated copper-panel screen that separates the kitchen from the combined dining area/ living room (see photo). There's also a copper bas-relief created by sculptor Robert Kushner against one wall. This architect obviously loves copper. Here's how he put it: "Copper is a natural material that becomes richer with time and achieves other colorations and therefore a depth. It works well with other natural materials and also lasts a very long time." In addition to all the copper and its alloys in and about his apartment, Pomeroy specified the copper roof for the restoration of New York's Grand Central Terminal (see Copper Topics No. 86) and the restored copper roof on the Livingston Manor in Garrison, New York. Built in 1894, this grand home overlooking the Hudson River is owned by descendants of Robert R. Livingston, who helped draw up the Declaration of Independence and later negotiated the Louisiana Purchase. Pomeroy's apartment has earned an award for excellence in design from the American Institute of Architects. It has been featured in such magazines as Architectural Record and Interior Design.